It took me quite some time to settle on a name with which I might brand my personal services. Nothing seemed to sit well with me. At some point, knowing I would be working primarily with WordPress, I thought to explore parts of the typewriter and the printing press. Maybe there I could find a suitable name. Google led me to a diagram of a typewriter mentioning the type wheel. Perfect! The type wheel serves as a go-between in early models of the typewriter. It is the part that responds to keystrokes, translating them into actual printed characters. 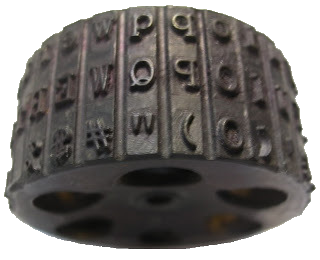 When a typewriter key is tapped, the typewheel spins into action, positioning itself so that it might properly make a mark on paper. This is the same purpose I hope to serve through Typewheel. In providing design and development, I aim to remain responsive to those who have called upon my services, positioning myself to make a mark for them online. I want to translate stories to the digital realm. Whether you are an artist, blogger, non-profit, or small business owner, I’ll come alongside you to design, develop, deploy, and maintain your WordPress site. Do you know of anyone needing such services? I’d love for you to connect them with me. More stories exist on the blank page than in the whole of history.